I didn’t break the bank too badly at the book fair yesterday. I got Sean some cool baseball books and myself a book or two as well. So, over to the garage again this morning, where Max treated (?) me to an interesting prey catch. He caught a juvenile seagull. I’ve seen the adults harry a seagull before. I think I even reported that here. So, when I saw Max tracking a seagull below him, I thought it might be the same thing. But, when he went into a dive, I knew he wasn’t playing around. He hit the seagull very hard right as they went over the Federal garage. Feathers flew. The seagull went limp and fell. Max dipped and caught the seagull. And kept on dropping. The damned seagull was about as big as he was. Over traffic. Over book stalls. Over the heads of excited bibliophiles sprinting across Congress for first crack at the vendors. Over thousands of people who never considered looking up, Max dropped, seagull in talon. And I held my breath. On a collision course with the ugly brick facade of the AT&T building, Max pumped his wings, trying to gain altitude. Finally, realizing he wouldn’t make it, he veered to the west and swung around. On his next try, he made it to the top, landing on the edge. For the next 40 minutes, I watched him pluck that seagull. He really put himself to the task with … verve. Finally, he hit paydirt and I stopped watching as his beak reddened. Did anyone below wonder why it rained feathers for a time? I dropped over in the afternoon just in time to see Max catch a large pigeon. 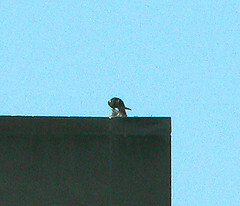 Hercules was barely visible on the top of a bay window outcrop at the top of a skyscraper (which I think is a hotel) to the SE. 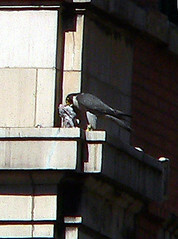 Max landed on the ledge, snipped the head off and then plucked for a good while before he grabbed the “prepared” pigeon and hopped around with it for awhile. It almost looked like he couldn’t find a suitable place to snack. After hopping to and fro, he finally took off again and landed on the nest ledge where he dropped in. He emerged a few minutes later sans pigeon. Guess he wasn’t that hungry. Chick Development: Our chicks should be about half down-covered and half feathered. Since waaaay back at day 22, there have been a lot of changes. The chicks are more likely to stand and rest while on their feet. The mustache or tears of black behind the eye has become more striking. They’ve also hit their full growth. You can see this stage here. ~ by Steph on June 4, 2006.